Or Silly Problems To Have, as Beth would say. My boss, I’ll refer to him as VP, organized with some clients/foremans to meet at Marble Brewery for socializing and general silliness yesterday afternoon. Well I got there early, and figured it would be an excellent opportunity to knit a bit with a frosty beverage! Alas, the place only served beer and stuff like lemonade and root beer. I don’t drink beer; I like it but the stomach ache isn’t worth it. Sigh. However, I settled in and worked on the toe of a sock that I pulled out of the vault. It’s toe-up construction, and luckily I wrote enough notes and stopped in the right place (a year ago? more?) that I could pick it up no problem. 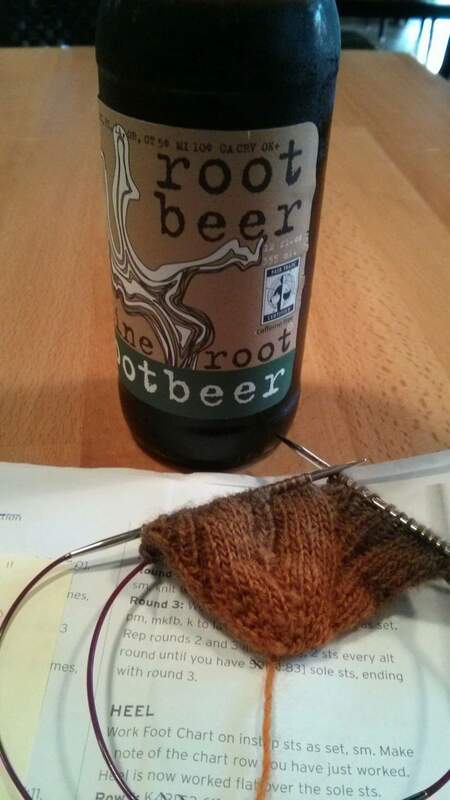 I enjoyed a tasty root beer and got a lot done on the sock! Aaaaand, I didn’t have a copy of the chart I needed. Zip. Sigh. But I do now! :-D Let Saturday morning commence!